This topic contains 16 replies, has 8 voices, and was last updated by Rebel 3 years, 8 months ago. You might remember that i already informed you about it. Think Atheist twitter account https://twitter.com/thinkatheist has been hacked. I came to know about it at the start of this year. One day i noticed that he has created an account on Patreon https://www.patreon.com/thinkatheist and asking for donations. I immediately sent an email to inform all members on Feb 17, 2015. We had discussion in detail about it on old site http://www.thinkatheist.com/forum/topics/topic-to-discuss-stolen-think-atheist-twitter-account. We had a bit discussion with the unknown hacker about it before he blocked me and other members. He claimed that it is his personal account but did not reveal his identity. Nobody knows who is running this account. This account has been associated with Think Atheist since day 1 https://web.archive.org/web/20081201085158/http://twitter.com/ThinkAtheist. Why he stole the account? It looks like he is a looser and can’t make ends meet through ethical sources. 1. First he started asking donations but when i informed members about it he had to delete Patreon link https://www.patreon.com/thinkatheist. 3. Please check image below. He has pinned a tweet where he is asking followers to use his coupon to to get 10% discount. Like you most of the followers are unaware that he is affiliated with the company. He gets commission when a customer uses his promo code at check out. 1. As you know that twitter account has been associated with Think Atheist since day 1. 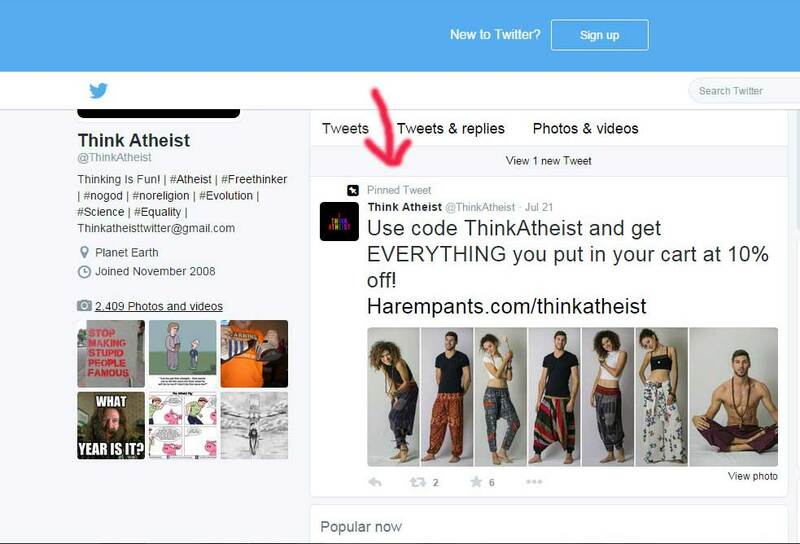 Many members still think that twitter account is associated with thinkatheist.com. He is posting controversial photos that are damaging not only our image but also other atheists. Here are a few. Unfortunately such controversial photos help him get more followers. Controversy = More followers = more coupons = more commission. If a follower argues with him, he treats him very badly. @0PT1MU5_CR1M35 There it is, the "but" word. Here's a thought, don't like my posts #fuckoff. Please report him. I have created a topic to describe how to report a twitter account http://atheistzone.com/forums/topic/think-atheist/. I think Twitter doesn’t allow poser accounts. While they may argue that the words “think atheist” is a bit too generic for us to claim, you could argue that they wouldn’t allow someone to claim Planned Parenthood or The American Catholic church and pose to represent those organizations. We are just smaller. I don’t know how responsive Twitter is, but they could certainly tell him to choose another Twitter name or be shut down. In the meantime, rather than taking people who land on ThinkAtheist.com to the AtheistZone.com homepage, take them to a page explaining that if they came here from Twitter, they should know that we are not associated with the Think Atheist Twitter page and deplore its contents. And of course also have a link to our homepage. Edit by Umar: The photo he has posted is just wasting bandwith of our users. Here is the link if anybody wants to see. This reply was modified 3 years, 8 months ago by Rebel. I reported it. Hopefully more people do as well. (Doesn’t hurt that some of us have been blocked for no good reason). Can we know your name? Could you not find a photo more than 6 mb? It will take even more time to load. 1) n. to publish in print (including pictures), writing or broadcast through radio, television or film, an untruth about another which will do harm to that person or his/her reputation, by tending to bring the target into ridicule, hatred, scorn or contempt of others. Libel is the written or broadcast form of defamation, distinguished from slander, which is oral defamation. It is a tort (civil wrong) making the person or entity (like a newspaper, magazine or political organization) open to a lawsuit for damages by the person who can prove the statement about him/her was a lie. Publication need only be to one person, but it must be a statement which claims to be fact and is not clearly identified as an opinion. While it is sometimes said that the person making the libelous statement must have been intentional and malicious, actually it need only be obvious that the statement would do harm and is untrue. Proof of malice, however, does allow a party defamed to sue for general damages for damage to reputation, while an inadvertent libel limits the damages to actual harm (such as loss of business) called special damages. 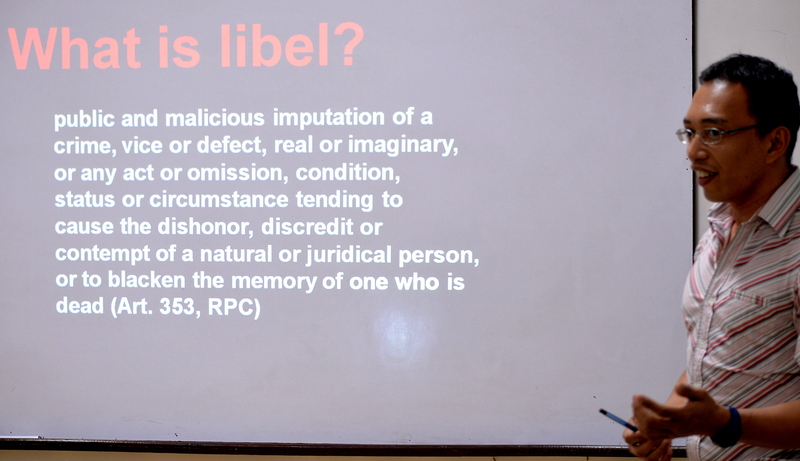 Libel per se involves statements so vicious that malice is assumed and does not require a proof of intent to get an award of general damages. Libel against the reputation of a person who has died will allow surviving members of the family to bring an action for damages. Most states provide for a party defamed by a periodical to demand a published retraction. If the correction is made, then there is no right to file a lawsuit. Governmental bodies are supposedly immune to actions for libel on the basis that there could be no intent by a non-personal entity, and further, public records are exempt from claims of libel. However, there is at least one known case in which there was a financial settlement as well as a published correction when a state government newsletter incorrectly stated that a dentist had been disciplined for illegal conduct. The rules covering libel against a “public figure” (particularly a political or governmental person) are special, based on U.S. Supreme Court decisions. The key is that to uphold the right to express opinions or fair comment on public figures, the libel must be malicious to constitute grounds for a lawsuit for damages. Minor errors in reporting are not libel, such as saying Mrs. Jones was 55 when she was only 48, or getting an address or title incorrect. 2) v. to broadcast or publish a written defamatory statement. Now the thief is threatening us? Nice to see you here. I was not expecting. I have banned him. He has nothing to say or defend. He came here just to threaten us. It’s pretty sad that some sour-grapes user has not only hijacked the twitter account, and is likely raising money for dubious reasons…what’s saddest is that the sour-grapes user has decided to come onto the site here, rub it in our faces and troll us. This is what the anonymity of the internet does. It allows people who don’t have to show themselves to troll, appropriate and misuse whatever they are lucky or clever enough to get their hands on. @davis. Probably the same mentality that thought it was clever to steal the Twitter account in the first place. Sad and pitiful really. Can’t imagine what the world looks like through the Twitter-thief’a glasses. Not pretty, I’d imagine. Good advice! I shall give it a try. Until now Twitter Support has not been very responsive. Now we have 2 topics about stolen account. TA HomePage is redirected to 1 of the topics that explains how to report it http://atheistzone.com/forums/topic/think-atheist/. I think this is the best way to deal with it. If you decide you want a Twitter account, maybe you could use AtheistZone since that is the name of the new site?